Adobe After Effects is powerful to edit visual effects compositing and accomplish image adjustment or color correction. But the problem comes when import raw videos from professional full-HD camcorders such as Sony PMW-150. It’s common that most Sony and Panasonic HD camcorders output .mxf file, which will not compress your videos. But it becomes a pain when you cannot edit or even preview it on Mac. Think about it—you just got a perfect demo about your lovely yacht after long time fighting against the wind buffeting, and you want to edit Sony PMW-150 files with Adobe AE CS6, but the raw videos shown as mxf could not playback well for editing. In this case, to get Sony PMW-150 mxf work in Adobe AE CS6, you need to convert Sony PMW-150 videos to Adobe supported video format. Many professional video editors prefer MEPG-2 or AVC codec for the good balance of video quality and size. If you have unlimited storage and require good quality, the MPEG-2 is recommended for its clear appearance while the AVC would compress the same video to half the size that MPEG-2 does. To accomplish your task without too much quality loss as well as quickly, an all-in-one Sony PMW-150 MXF Converter is recommended. 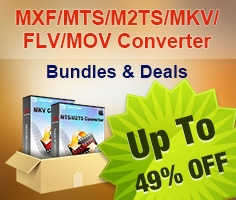 Here we suggest you give a go with Pavtube MXF Converter, a powerful program to which suits most HD camcorders from Sony, Panasonic and Canon. Now just download it and follow the steps below to get this program work smoothly for you to import MXF to Adobe AE CS6. 1. Install and launch the mxf converter on your Mac, click “Add Video’ to load individual videos, otherwise you can ‘Add from folder’ to load all the raw videos in .mxf format. 2. Choose output format. Click "Format" bar, you can get optimized videos for Adobe >MPEG-2 (*.mpg). If you like, you can click "Settings" to change the video encoder, resolution, frame rate, etc. 3. After above settings, you can click "Convert" button to start the conversion from mxf to mpg. 4. After the process, press “Open” to locate converted files and load the videos to edit in Adobe AE. Now open up Adobe and you’re ready to import Sony MXF to Adobe AE CS6 for post-production.